This is my puzzle with the largest number of pieces. It took me a lot of time to cut several battens and glue the pieces. After all these efforts I didn't want to make only a box with the pieces and I decided to construct an 11x11x41 tube with wall thickness 2. The walls are saved beween acrylic glass and it's no problem to move the whole construction. Here is the picture of the eight wall parts. 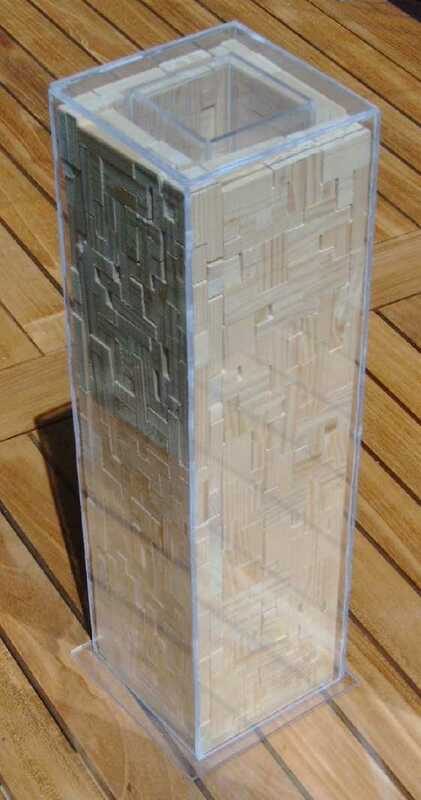 Only one piece must be added at the top to complete the construction. Holes are red marked. Using four of the parts and changing the other ones a 43x43x9 ring with wall thickness 2 can also be made. I think it isn't difficult to connect the parts. For my solution of the 8x9x41 box look at the Poly Pages.